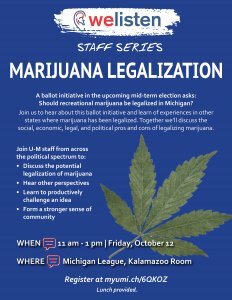 Join us at this WeListen Staff Session to learn about the debate surrounding marijuana legalization and to participate in small group discussions about this complex topic. Our aim is to bring liberals, conservatives, libertarians- everyone across the political spectrum- together for constructive conversation. The goal of WeListen discussions is not to debate or argue, but to understand the views and values of others and to learn from their perspectives. The session will begin with a brief content presentation to provide a basic understanding of the topic. No specific level of knowledge is required to participate in WeListen discussions. 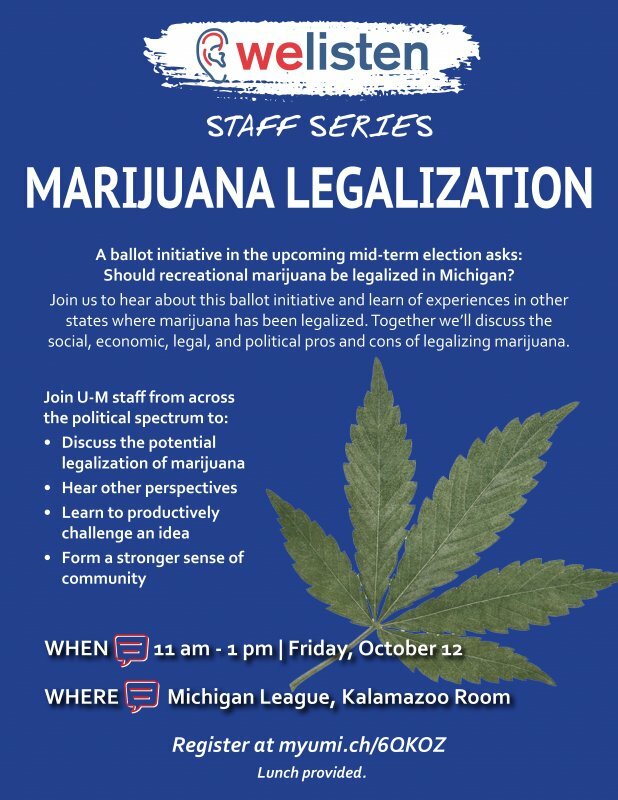 This event is co-sponsored by the UM Office of DEI and the LSA DEI Implementation Leads. The planning committee includes staff members from the Ginsberg Center, the LSA Dean's Office, LSA History, LSA Psychology, the Office of Communtiy-Engaged Academic Learning, and the Michigan Community Scholars Program.